The area of today’s Old Town Square used to be a market which had been there before Old Town was founded. Originally it was a free space market, houses started being built later. By 1211 it already had its own administrator who was collecting fees and looking after the smooth running of the markey. In 1338 Jan Lucembursky issued a decree which enabled the village to build a town house. It comprised nine houses. 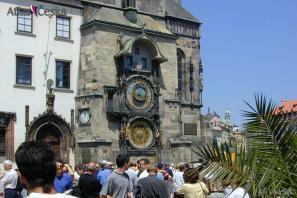 Also built at this time was the Old Town Tower on which the famous astronomical clock was placed. The Old Town Square has always been at the centre of the most important events in Czech history. For instance, in 1422 Jan Zelivsky was executed here as well as Jan Rohac from Dube in 1437. The well-known execution of 27 Czech nobles, participants of the uprising against the Habsburgs, took place here in 1621. In 1902 a demonstration for universal suffrage was held here and in 1948 it was the place where the Communist Party’s launched its power takeover. The Old Town Square is located on the Royal Mile which leads from today’s Republic Square through Celetna Street, Little Square, Charles‘ Street and over the Charles Bridge towards Prague Castle. There are many beautiful historical houses and other cultural, historical and clerical landmarks along the way. Nowadays the tradition of markets is revisted twice every year with the Christmas market and the Easter market, both equally atmospheric and picturesque and enjoyed by tourists and Praguers alike. Old Town Square is undoubtedly a must see that no one misses when visiting Prague.